Building on Patterns is a systematic, comprehensive, and balanced literacy program designed to teach young children with visual impairments to read and write using braille. This page contains a wealth of resources to support teachers of students with visual impairments as they use Building on Patterns Prekindergarten in early literacy programs with young braille-reading children. These resources are designed to provide teachers with additional background information, models of teaching techniques, and downloadable materials. See answers to the most frequently asked questions. This one-page “Quick Start" guide provides brief but important information for teachers about materials and information that can be used by teachers at the very beginning of their preparation for using Building on Patterns Pre-K. These files are electronic versions of the hard copy included in the Teacher Kits. In the three photos shown here, a teacher is sitting behind a child with her arms reaching around the child. The teacher’s hands are exploring a page or toy, demonstrating an activity from the child’s perspective and modeling hand movements. The child's hands "ride" on top of the teacher's. Hand-under-hand technique allows the child to be in control of his or her tactile exploration. 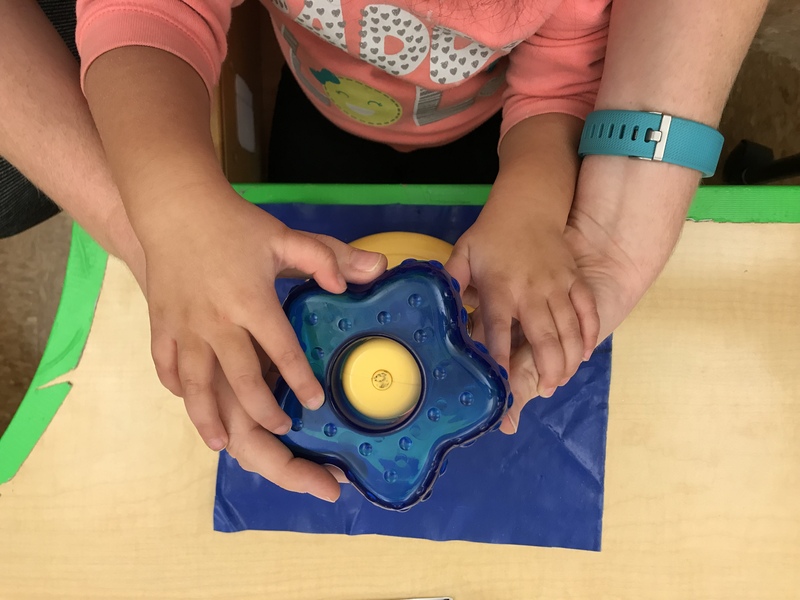 Exploring a toy: This photo shows a teacher using hand-under-hand technique to help a child explore a toy with a bumpy, flower-shaped top. The teacher's right hand is around the side of the top of the toy, and her left hand is reaching under the top. The child's hands are partially on top of the teacher's and partially on the toy. Exploring a line of braille (2 photos): These two photos show a teacher using the hand-under-hand technique to demonstrate tracking a line of braille. In the first photo, the teacher's hands are side-by-side at the beginning of the first line of braille on a page. Three fingertips of her left hand and four fingertips of her right hand are on the braille. The child's hands are on top of the teacher's with her fingertips almost on top of the teacher's. In the second photo, the teacher's and child's hands have slid to the right to track the line of braille. Printed hard copies are included in the Student Kit. However, it is recommended that you customize these to you, your student, and your student's family using the files linked below. Parent Letters for each lesson – There is one letter to go with each lesson. Send the corresponding letter to the child’s family on the first day of each lesson. .docx file with images of braille. This file is provided in case you are not able to install a new font on your computer. Printed hard copies are included in the Student Kit. The performance of the students documented in these assessment charts does not reflect typical or expected progress. When following the BOP Pre-K program, it is important to move at the child's pace, using the data collected to plan instruction and address needs. Your individual student may move at a faster or slower pace than shown in the sample charts. These sample charts provide suggestions for how to fill in the various data collection charts; however, you will want to consider your student's individual goals when taking data. Some of the charts are purposely designed to be open-ended so that you can focus on your student's unique strengths and needs. When using a screen reader with the docx file linked below, please make sure it is set to read some punctuation. Bullets are used before items in place of circling. Below are audio files (.mp3) for the songs included in the lessons that are less likely to be familiar. A set of print children’s books and a set of braille children’s books are included in the Student Kit. To create print-braille versions of the books, emboss the braille ready files (BRF) onto APH Braillable Labels and Sheets (Catalog Number 1-08874-00) or other braillable adhesive labels and apply them to the print copies of the books. Lesson 3: What’s the Weather? The braille translation of the print page that starts with “Mama and Papa beamed” in You Be You does not fit on the print page. The two additional braille pages of runover text can be embossed on paper and inserted into the book. Lesson 7: What’s it like to be...a BUTTERFLY? The braille translation of print pages 22–24 in What's it like to be...a Butterfly? does not fit on the corresponding print pages. The four additional braille pages of runover text can be embossed on paper and inserted into the book. Lesson 14: How Do Dinosaurs Eat Their Food? The braille translation of print pages 23 and 24 in Keeping Fit does not fit on the corresponding print pages. The three additional braille pages of runover text can be embossed on paper and inserted into the book. Lesson 20: What’s it like to be...a SPIDER? The braille translation of print pages 22–24 in What's it like to be...a Spider? does not fit on the corresponding print pages. The four additional braille pages of runover text can be embossed on paper and inserted into the book. The braille translation of the print page titled “Note to Parents” in My Friend the Doctor does not fit on the print page. The five additional braille pages of runover text can be embossed on paper and inserted into the book. The braille translation of the recipe on print pages 30 and 31 in Bee-bim Bop! does not fit on the corresponding print pages. The nine additional braille pages of runover text can be embossed on paper and inserted into the book. The braille translation for 11 print pages in The Day the Crayons Quit does not fit on the corresponding print pages. The 11 additional braille pages of runover text can be embossed on labels and applied to the facing print pages that have no text. The print pages affected are the following colors: red, purple, beige, gray, white, black, green, yellow, orange, blue, and pink.